How can a man spend his morning getting eaten alive by mosquitoes, getting wet to his waist, and falling off a rock have a good morning? Here’s how: I carried in two pieces of the tree stand that is going on Buck Knob. In the process, the mosquitoes took advantage of the fact that I didn’t have a free hand, and I was rushing to beat the oncoming rain. When I got there, I couldn’t make out the exact tree that I want to use, so I looked for a place to hide the ladder parts. I saw this large log that would do the job. I walked over to it, started to put the parts down, and there looking at me was a moose shed! It was heavy, but the tip and brow tine were chewed off. 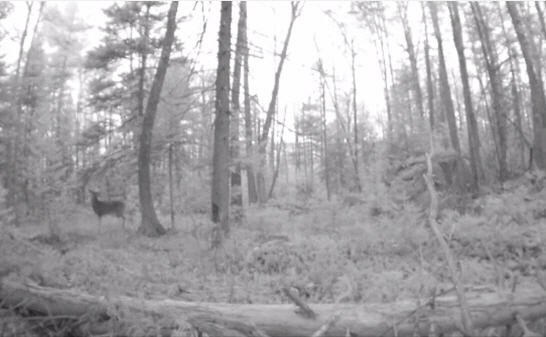 I set the camera up in a slightly different spot in hopes of not spooking the buck. I then headed for Tony’s lot to check the camera I put out there on the 9th. There was a ton of fresh track, and the eight apples I put out were all gone. First, I got several videos of an opossum. 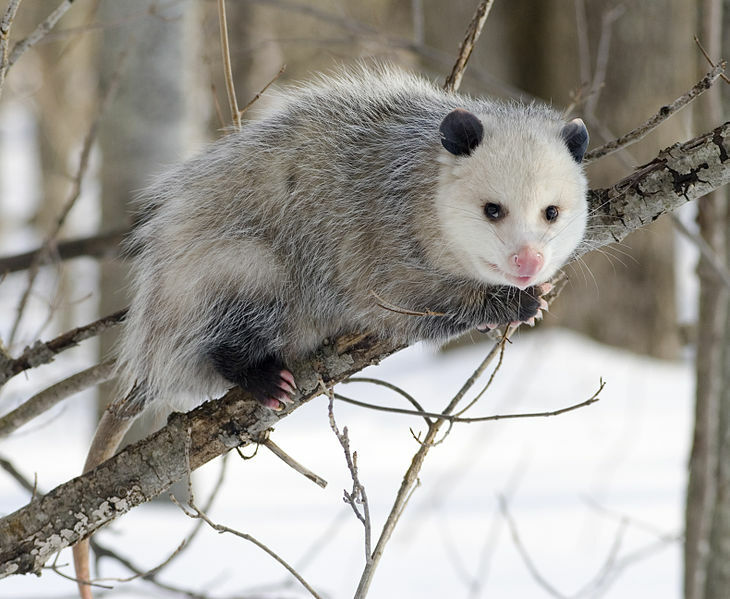 I have never seen a possum in Washington. The closest was a road kill in Antrim. Second, and far more important, was a huge 8-pointer that was the reincarnation of my Kingsbury buck. His antlers were still in velvet, but were perfectly shaped and balanced. Because of the apples, I got a tremendous look at him. He was there three times in four days, BUT always at night between 10 and 1. 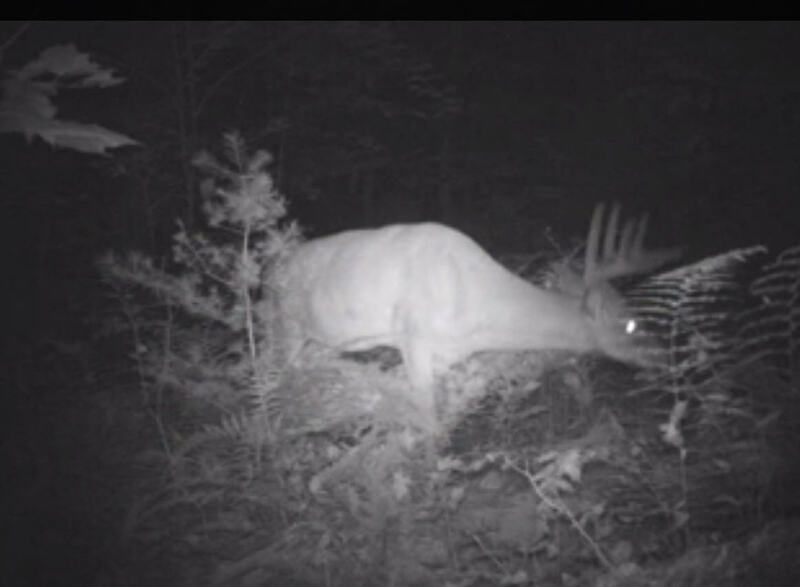 I can’t wait to start scouting him further and look for a stand site there. So I pulled the whole thing (rather than just the SD card) in case I needed to deal with a problem. The first video was taken yesterday. It was a nice doe at 6:30 AM looking very nervous. 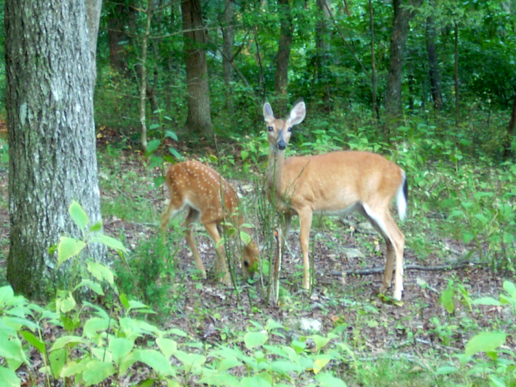 The next one was her spotted fawn stepping out directly in front of the camera. Both were very nervous focusing their stare towards Stand #1. The next video they are gone! There was all kinds of room and area to see them if they walked off, so I guessed they bolted. An hour and a half later, out steps our big buck! 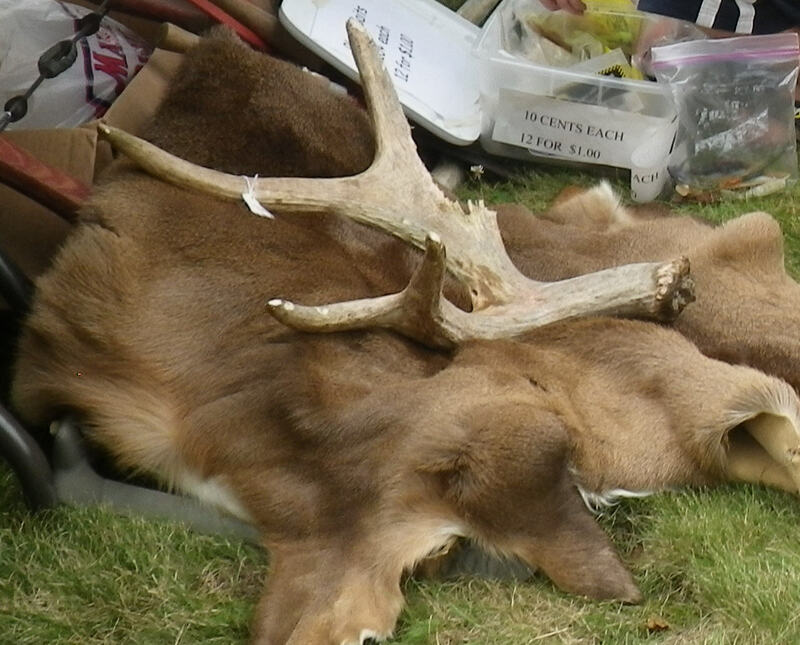 His rack covered in velvet, VERY WIDE, he trots off towards Stand #3–where I guessed the other two went. The next video, 5 minutes later, he is standing in the scrape sight. He starts thrashing his antlers in the overhanging evergreen that last year’s buck, and every other buck, uses as a licking branch. He moved so much and so fast that I’m going to have to look closely to determine the number of points. He is at least an 8 and probably more. I guess this proves the need for a stand on Buck Knob. Wow! Now that will get your juices flowing. Lots of water, not even considering it was August, which gives us a bumper crop of mosquitos. 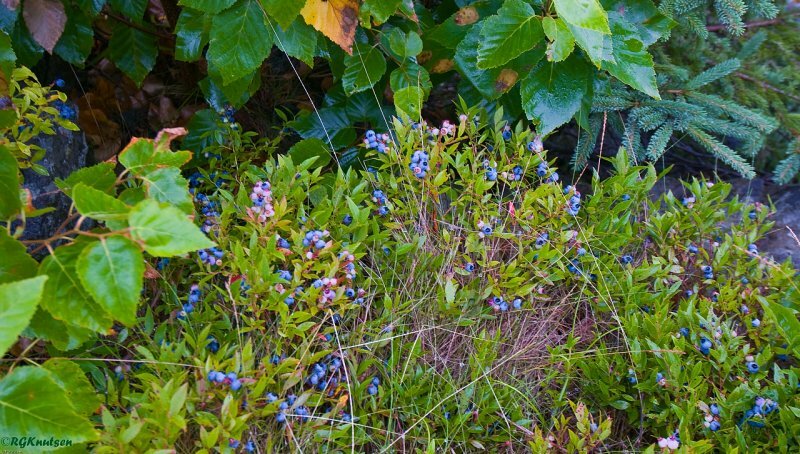 The biggest, if not the most, low bush blueberries I ever saw. Consequently two steaming fresh piles of bear droppings. 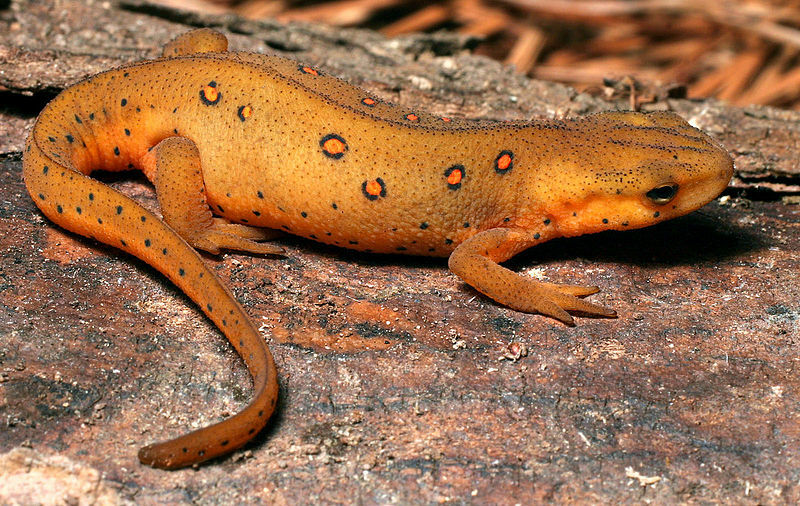 Saw red efts, the juvenile eastern red-spotted newts, for the first time this year. Still too early to get a good indication on the acorn and beechnut crop.